This is a traditional dough used when you are making pitas or pies stuffed with veggies, greens and other goodies. Different from fillo dough that comes in flaky sheets, batter dough envelopes your pita filling in a light, golden cake. Perfect with sweet or savory fillings, you’ll find a million ways to use this dough! I’ve written the scaled recipe here. Each batch (2/4/or 6) covers both bottom and top layers of dough for the pans described. 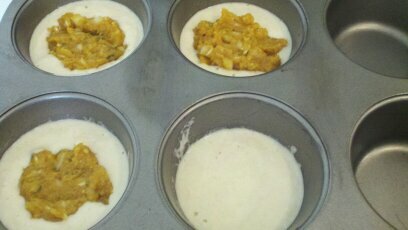 The 2 cup measurement gives you enough batter for 6 good sized muffin cups. The 4 cup measurement gives you enough batter for a dozen muffin cups, loaf pan or an 8″ round pan. The 6 cup measurement gives you enough batter for a 9×13 rectangular pan. And if you’re going to use all-purpose flour instead of self rising – add about 1/2 teaspoon of salt and 1 1/2 teaspoons of baking powder for every cup of flour. Combine flour, sugar and water. Stir until completely combined and smooth. Mix in olive oil and allow dough to rest on the counter top for 30-60 minutes before using. Pour 2/3 dough on bottom layer of your pan, add filling and cover with remaining 1/3 batter. It’s ok if your batter doesn’t completely cover the filling. Once the dough bakes up, it will cover and be fine. Bake at 375 degrees until golden. I don’t see the recipe, but I’d love to try them! i would love to use this recipe but it appears it is cut off? there is no recipe in this post. made the pitas earlier tonight. i did not grease the muffin tin because it looked to be nonstick…they were so stuck i had to dig them out with a spoon. 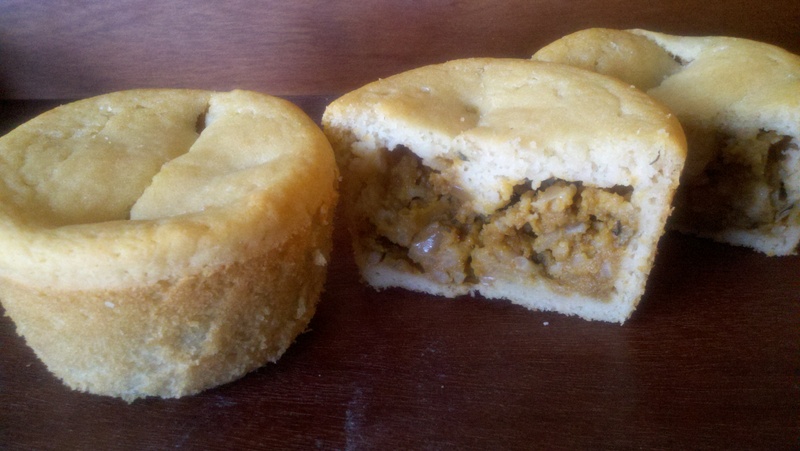 the second attempt with a regular muffin tin, i sprayed with olive oil first. they were still all stuck and also not cooked well on the bottom and all soggy with oil. i guess next time i’ll try papers. i really do want to get it to work in muffin form so i can send them for lunches. i made up my own filling with things i had on hand. onion, garlic, mushrooms, etc. sauteed til soft in olive oil. added salt/pepper, dill, parsley, bread crumbs and some grated parmesan cheese (from a container, not the best, i know), but the flavor was really good. the batter is a snap to mix up and i will be trying with lots of different fillings both savory and sweet and will perfect the muffin baking option somehow! What about salt? If I am making savory pitas, do I need salt in the batter? Thanks! Can I cook the dough on a hot pan like a pancake for gyro sandwich’s? Hi Kiki, my dough didn’t bake properly. It still seemed unbaked after 45 min. at 375F in the oven. Pls advise…what did I do wrong? Any recommendations for gluten free dough? I make my own mix of gluten free self rising flour based on the recipe from Gluten Free and more magazine. However the dough seemed extremely thin and did not envelope the filling….it was still tasty just not pretty and golden. Just discovered this wonderful blog! These pitas caught my eye as I love bread products with fillings for tea time ! And this seems so no fuss …Before trying this out I’d like to clarify something , the water flour ratio is the same like 2 cups flour , 2 cups water , 2 tbls olive oil / 4 cups flour 4 cups water etc … and what fillings are popular in Greece ? I see you have posted a squash one and mushroom one, ty in advance ! squash and mushroom are the fillings I know best but to be honest, you could experiment with lots of options just so long as the water content of the filling is low. otherwise you’ll end up with soggy pitas!